By using the “WingSALD bio” software for Aggregates Sizer, the vertical axis of the graph can become a concentration (unit: μg/mL and particle amount can be evaluated quantitatively). In the above graph, the cumulative amount data and differential amount dada can be overlaid. Cumulative data Q can be displayed by line chart and differential data q can be displayed by bar chart. Vertical axis indicates the measured concentrations by Aggregates Size and horizontal axis indicates concentration as measurement conditions of 0.1 ppm, 0.5 ppm, 1 ppm, 5 ppm and 5 ppm. This graph shows good linearity of concentration measurement by Aggregates Sizer. The stable optical system used with the laser diffraction method enables accurate detection of scattered light. 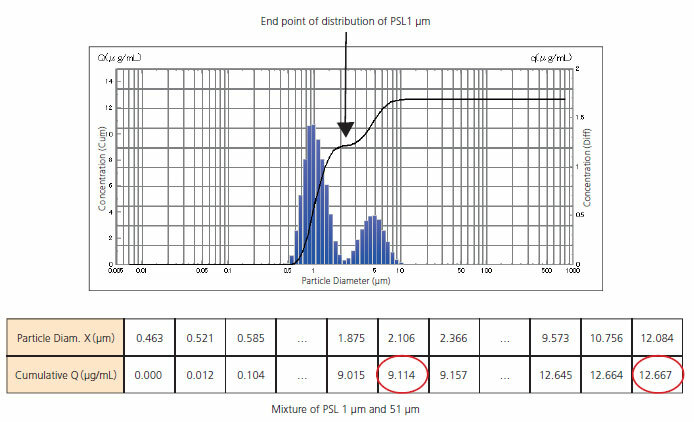 The following table shows measurement results using a PSL standard particle of 1 μm, changing the concentration conditions (0.5 ppm, 1 ppm, 2.5 ppm and 5 ppm) to confirm the repeatability. CV values for all conditions are less than 3%. The intensity of scattered light from large particles is high and changes frequently within the forward small angle. In contract, the intensity of scattered light from small particles is very low and changes slowly within the large angle. Aggregates Sizer uses Wing sensor II, which consists of 78 concentric sensor elements, and the area of the respective element can increase logarithmically from center to outer. Therefore, Wing sensor II can effectively detect the scattered light intensity pattern of a wide particle size range, enabling high resolution. From this graph and table, we can determine that the concentration of PSL 1 μm is 9.114 μg/mL and that of PSL 5 μm is 3.553 μg/mL, which can be calculated by subtracting 9.114 from total value of 12.667 μg/mL.